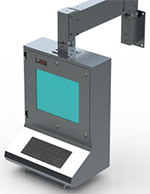 Designed to be mounted in the wall, the microOP/ATM is ideal for locations where space is at a premium. These sleek workstations are designed for when you need mount your PC remotely. New 3D Viewing Tool Coing Soon! OP/Station now certified to provide UL labeled units for hazardous areas. Head over here for more details!